MedChemExpress (MCE) offers a wide range of high quality research chemicals and biochemicals including novel life-science reagents, reference compounds, APIs and natural compounds for laboratory and scientific use. 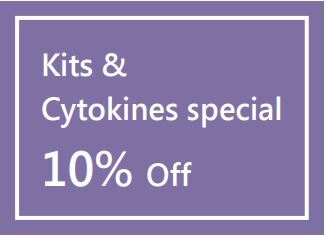 Get 10% discount on your next MCE order for kits & cytokines using the promo code MCE2019#KC. THP reserves the right to cancel or refuse this promotion at any time. 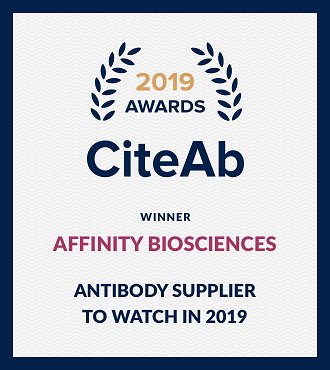 Celebrating the very best suppliers and individuals in the research reagent sector worldwide with „Affinity Biosciences“, the Antibody supplier to watch in 2019. Receive 1 additional antibody for free when buying 2 primary antibodies from Affinity Biosciences. Offer is valid until 30.6.2019. Promo code „AFAJ19“ must be placed with the order. The antibody with the lowest price will be FOC. THP reserves the right to cancel or refuse this promotion at any time. Explore multiple targets with customisable antibody panels from proteintech. The panels are a convenient and affordable way to screen multiple prospective targets without the need to invest in full-sized antibody vials. Perfect for researchers starting a new project or those who require less volume. To take advantage of this offer, place an order of either 3, 5 or 8 20ul antibodies and quote the code GEUR19PANL. HumanKine Active Cytokines and Growth-Factors are not included. Proteintech control antibodies are €149 each for a 150ul size vial. This promotion cannot be used in conjunction with any other promotional offer. This discount only applies to the antibodies stated above. Custom production antibodies and any other pre-made antibodies from our catalog are not included. If the promotional offer is redeemed in the UK the antibody price is £149. In Europe the price is €149. This promotional offer is subject to availability. THP reserves the right to end the promotion at any time.